Savannah Christian swept Tattnall Square to win the Class A Private state championship Friday night. 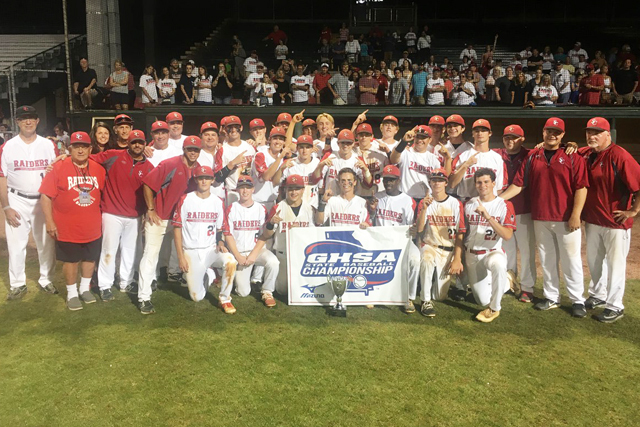 SAVANNAH -- Jarrett Brown's walkoff single in the bottom of the seventh inning in Game 2 helped Savannah Christian to a 5-4 victory and a series sweep of Tattnall Square Friday night in the Georgia High School Association Class A Private School state championship series. The 5-4 victory followed a 5-2 win in the first game, helping Savannah Christian win its first state baseball championship for Hall of Fame coach Carl Carter. The Raiders also dethroned the defending Class A Private champions who were seeking their second straight title after joining the GHSA from the Georgia Independent Schools Association three years ago. But Brown cut down Tattnall Square (31-5), igniting a wild celebration at historic Grayson Stadium. With one out and the Trojans desperately trying to force extra innings to stay alive, Kyle Hilton walked. After Garrett Houston got Ben Jackson to fly out for the second out, James Portzer was inserted as a courtesy runner for Hilton. Portzer stole second and Tattnall intentionally walked Zack Brockman, setting the stage for Brown's heroics. With a 2-1 count, Brown ripped a single into left field to score Portzer for the game-winning run. Tattnall had rallied in the sixth with four runs on just a hit to tie the game at 4. Savannah Christian had scored four runs to grab a 4-0 lead in the bottom of the fifth. Hilton was the winning pitcher, allowing just two earned runs on two hits and striking out eight to outduel Garrett Houston. The victory came on the heels of Zack Brockman's pitching gem in Game 1 when he allowed just two earned runs on five hits to earn the complete-game victory. He surrendered a run in the first inning before Savannah Christian scored a run in the second and third innings, then erupted for three more in the top of the fifth on an RBI single from Jackson and Brown's RBI single that scored two. Tattnall scored one in the fifth but couldn't get any closer. Savannah Christian pitchers Brockman and Hilton may have been the biggest story, holding Tattnall to a combined seven hits in the series. Top-ranked Savannah Christian (34-3) ended its season on an 18-game winning streak. The Raiders hadn't loss since falling to O'Fallen Township on March 25. Brown finished the series 3-for-7 with three RBIs. Editor's note: Some excerpts from the Savannah Morning News was used in this story.